Sometimes, homeowners who schedule a new swimming pool installation in Salt Lake City are surprised by the number of steps there are and the amount of time it takes the pool contractors to complete the process. Whether they are classic rectangular lap pools or modern designs that mimic natural ponds and lagoons, residential pools and hot tubs are much more that simple holes in the ground filled with water. Read on to learn more about swimming pools and how they work. vinyl or fiberglass. Then they install all the plumbing and machinery that will keep the pool fresh and clean, including the drains, pump, filter, returns, and an optional heater. Once it is installed and filled, the water does not simply sit in your pool—algae, bacteria, mosquitos, and other unpleasant organisms can breed quickly in stagnant bodies of standing water. The circulation system in your pool helps prevent this. The pump draws water out through the main drains on the basin floor and the skimmer drains around the top edge. The water is pumped through the filter, then the heater (if you have one installed), and then back into the pool through the return pipes. 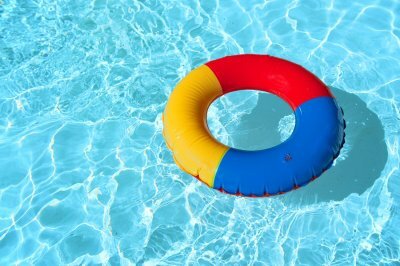 During pool season, you should have a professional visit about once a week to perform routine maintenance on your pool. He should clean the surface of the pool, the skimmer baskets, the drains, and the filter; he should inspect the pump to ensure that it is working properly; and he should test water and add chemicals as needed to maintain proper balance. During the winter off-season, you may need to fully drain your pool, or at the very least put a pool cover over it.